Projections are the most reliable indicator of future performance. There’s room for context, of course, but the best indicator of what a player will do is what he has done. What do fantasy owners do, though, when the models themselves can’t agree? Using Baseball Prospectus’ PECOTA and Fangraphs’ ZiPS and Steamer systems, we can find some notable players on whom the computers have differing opinions. This week, I’ll look at position players. Next week, I’ll pivot to the pitching side. Some of the discrepancies can be explained by playing time differences. Those are manually-entered and generally difficult to predict. Injuries, roster moves and unexpected performances can alter how often players get on the field. I’ll set those differences aside and instead focus on differences based on the players’ respective true talent levels. Most notable is a 20-year-old wunderkind who’s costing owners a top-30 pick in 2019. The systems all agree that Juan Soto is a star; where they differ is on exactly how much power we should expect. Soto hit 22 jacks in under 500 plate appearances as a rookie, so it’s reasonable to forecast him to top that in 2019. Not only will he get a full season, he should theoretically continue improving. Just how much untapped power is in here is the question. PECOTA only projects Soto for 23 homers next year. While some of that is about a pessimistic playing time forecast, his projected rate stats are depressed. Despite Soto’s .517 SLG as a rookie, PECOTA forecasts a regression to .270/.372/.470. If that seems pessimistic at first glance, it very well might be. Steamer anticipates Soto to match his .292 average and .517 SLG from 2018 over a full slate. ZiPS, though, thinks Soto’s being woefully underappreciated by the other models. Dan Szymborski’s system has Soto at a projected .296/.400/.559 with 36 bombs. Soto is the only player whom the model projects to finish top-10 leaguewide in both average and homers. (Yes, even Mike Trout and Nolan Arenado fall just outside the top 10 in projected batting average). So, what do we do here? Is Soto closer to a top ten guy or a top fifty guy? While the answer- predictably- is somewhere in the middle, ZiPS’ forecast seems shockingly optimistic. It’s tough to imagine a 40-homer season from someone with his profile. Most notably, he hits a ton of ground balls. His 1.87 GB/FB rate last season showed no signs of letting up as the season progressed. While he’ll always have a high HR/FB rate because of his raw power, that isn’t the batted ball profile of a slugger. 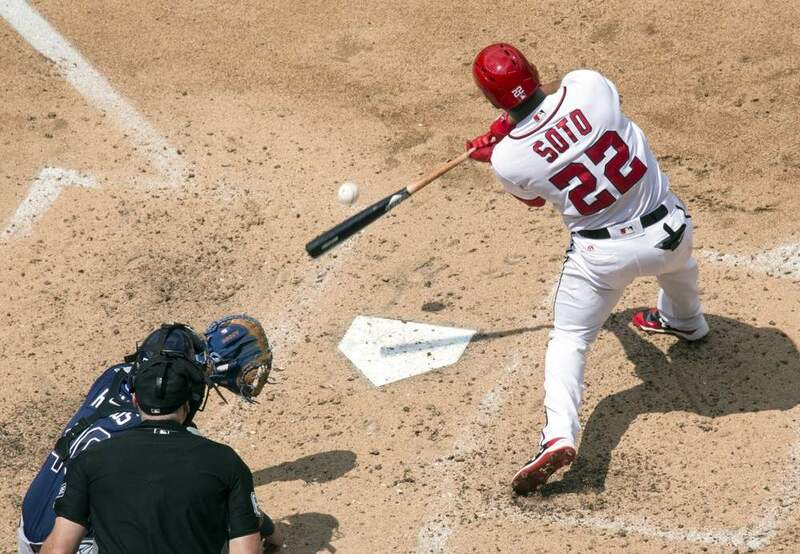 Instead, Soto’s more of a contact-over-power offensive player, at least right now. This jibes with scouts’ 20-25 HR per year projections from Soto’s minor-league days. Soto’s approach might also work to tamp down his over-the-fence power. Soto had a bottom-15 swing rate last season, translating into his absurd strikeout and walk numbers. While that makes him incredibly valuable in OBP leagues, it tamps down his traditional fantasy appeal. Swing this rarely, and you’ll pass up some opportunities for home runs. Joey Votto, the model for this type of hitter, has only twice exceeded 30 home runs in his career. Of course, Soto’s all-fields approach makes PECOTA’s .270 projected average awfully pessimistic. Something like .290 with 25 home runs seems most reasonable for Soto. That’s valuable, but it’s not too much more than what one could get from Starling Marte or Adalberto Mondesi, who also bring steals to the table. Soto may be on a Hall of Fame track, but he’s not a guy to target in the first two rounds in 2019. Steamer loves Marcell Ozuna. The model has him at .288 with 27 home runs, which would make him a steal at his current ADP (#74). ZiPS and PECOTA, though, have him hitting .010 to .015 points lower with home run totals in the low-20’s. For projection systems, that’s a rather significant difference. Here, context seems to support the more optimistic forecast. Ozuna slogged through a tough first year in St. Louis, but he was plagued by a shoulder injury. At the very least, the injury clearly impacted his throwing arm, and it’s plausible- if not probable- that carried over to the batter’s box. That said, Ozuna’s Statcast data were surprisingly impressive. His exit velocity was actually up from his breakout 2017 season in Miami, and he got stronger as the year went on. His batted ball data suggests he deserved better than the .280 with 23 homers he put up. He cut back his strikeouts and pulled the ball more, and he’s still only 28 years old. Steamer’s faith in Ozuna might very well be rewarded. Young players are the toughest to predict. It shouldn’t be a surprise, then, that the projections are struggling with baseball’s number one prospect. All three models, though, have eyepopping optimism. When you hit .402 as a 19-year-old in Double-A, it’s easy to see why. I can rehash scouting reports lauding Guerrero’s offensive aptitude, but fantasy owners know all about the huge raw power, bat speed and plate discipline. An oblique injury will delay Guerrero’s MLB debut even further than the few weeks it would’ve taken him to “work on his defense,” but he’ll be up soon enough. While ZiPS’ relative caution seems most appropriate for a player yet to see a MLB field, this look at Guerrero’s projections was mostly to marvel at what he’s accomplished thus far. Steamer projects only Daniel Murphy for a higher batting average next season. PECOTA, meanwhile, is even more bullish. Remember, that .310 projected batting average is a median outcome. Consider PECOTA’s 90th percentile forecast, essentially measuring Guerrero’s realistic ceiling. In a dream year, Guerrero hits .349/.412/.588 with 26 homers. No one should expect that output, but that it’s even possible is remarkable. Given the similarities in their respective projections, it wouldn’t be crazy to take Vlad in a similar area of the draft as Soto. Soto feels safer, given that he’s already found big league success. That said, there’s a strong argument that Vlad is a superior hitter right now. By May, he might be a top 20 hitter in baseball.